In accordance with measures announced by the City of Mexico to limit the congregation of large crowds, the U.S. Embassy in Mexico City will suspend all non-essential consular services from Monday, April 27, 2009 through Thursday, April 30, 2009. On Friday May 1st the Embassy is closed for a local holiday. From Monday, April 27 to Thursday, April 30th, consular services for U.S. citizens will be limited to citizenship applications (passports and consular reports of birth abroad, or CRBA) and emergency assistance only. Notarial and other routine services will not be available; anyone with passport or CRBA appointments is encouraged but not required to reschedule to a later date. Additionally, the Federal Benefits Unit is requesting all persons to postpone interviews on Social Security claims. The Visa Unit also suspends normal operations during this week. Visa applications scheduled for this week will be rescheduled according to the announcement. Read the whole thing here. The US Embassy Mexico mission is one of the largest in the world with nine consular posts and 14 consular agencies around Mexico. It looks like the suspension of consular services is limited only to the US embassy at this time, and does not include the constituent posts around the country. CDC has also been working closely with public health officials in Mexico, Canada and the World Health Organization (WHO). Mexican public health authorities have reported increased levels of respiratory disease, including reports of severe pneumonia cases and deaths, in recent weeks. CDC is assisting public health authorities in Mexico by testing specimens and providing epidemiological support. As of 11:00 AM (EDT) April 25, 2009, 7 specimens from Mexico at CDC have tested positive for the same strain of swine influenza A (H1N1) as identified in U.S. cases. However, no clear data are available to assess the link between the increased disease reports in Mexico and the confirmation of swine influenza in a small number of specimens. WHO is monitoring international cases. Further information on international cases may be found at [the WHO website]. More here on the use of oseltamivir or zanamivir for the treatment of infection, including how it works and its possible side effects, especially on children. CDC has not recommended that people avoid travel to affected areas at this time. CDC has posted recommendations at the CDC Travelers’ Health page to help travelers reduce risk of infection and stay healthy. 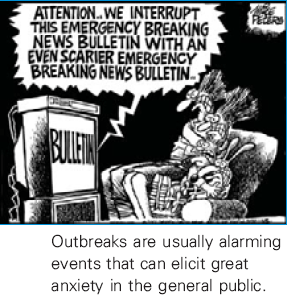 Note that the current World Health Organization phase of pandemic alert is at 3, the initial stage which correlates with preparedness, including capacity development and response planning activities.